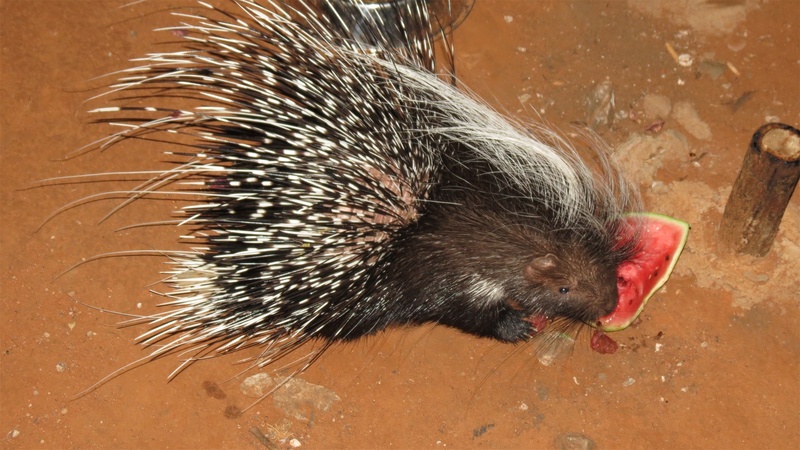 On October 12, 2014, a baby porcupine was brought to Tsumeb Veterinary Clinic. He was found on his dead mother about 20 km from Tsumeb on a farm. 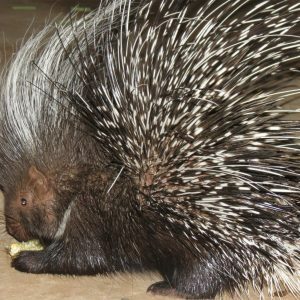 It was once again love at first sight but no one really knew how to raise a porcupine so it was by trial and error that Hermanus’s story can be told. 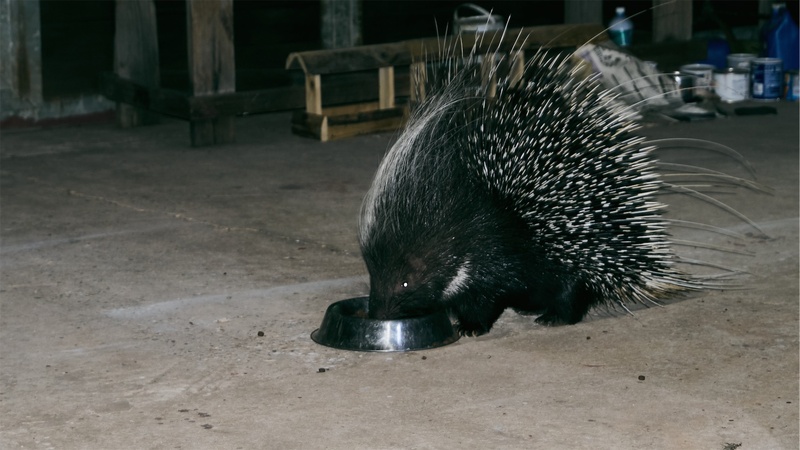 He was difficult to hold as his little quills was very sharp and he already had the instinct of reversing into his prey when he felt threatened. 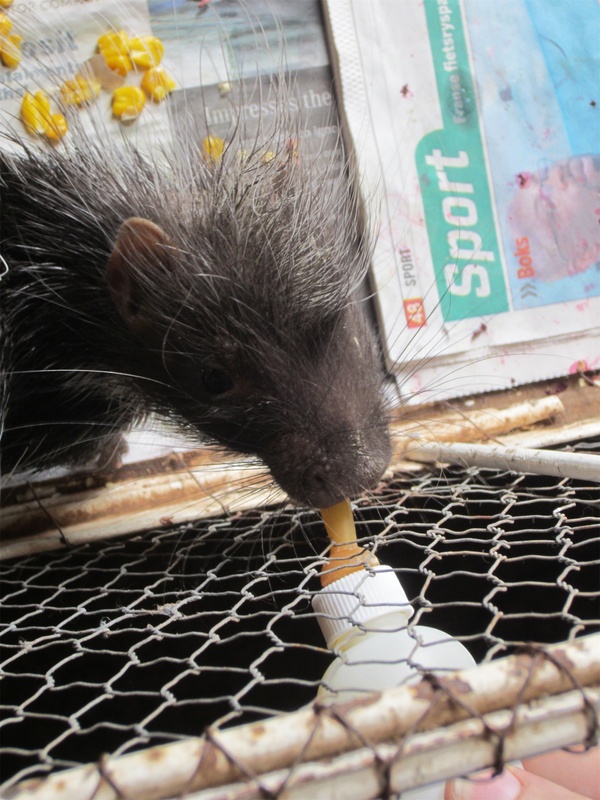 His first home was a budgie cage and we gave him milk in a hamster bottle, which he started to drink immediately. 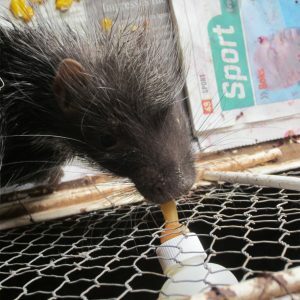 In November we moved Hermanus to ZURI and he lived in a chicken coop. At first he lived on the porch and the dogs was really intrigued by him. 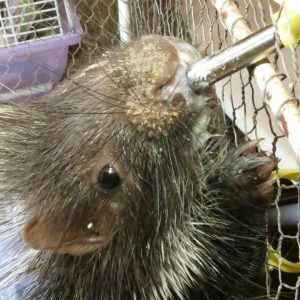 As soon as the chicken coop was open they ran in only to come out with some quills in their faces. 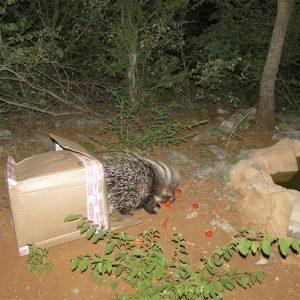 We moved Hermanus in December into the veldt about 500 m from the house so that he could be closer to nature. 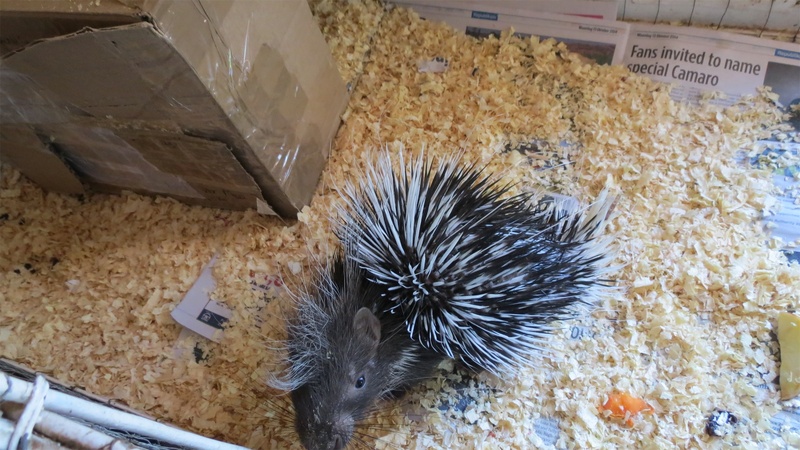 Every time we moved him it was quite a challenge as his quills were getting sharper and longer. 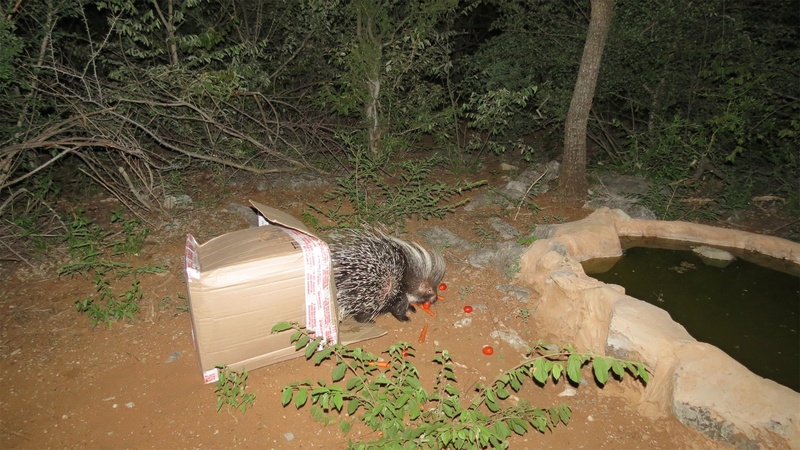 On the 3rd of February 2015 we released Hermanus close to the waterhole on ZURI. It was a sad day as we were both proud and excited for him but also worried for him. 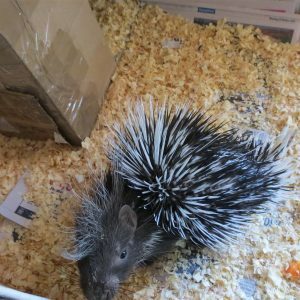 Big was our surprise when about 4 days later we saw a tiny little black nose under one of the containers on ZURI. 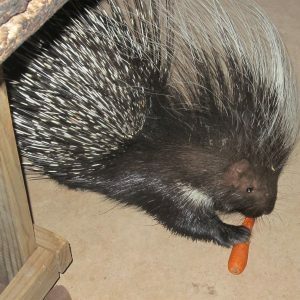 We immediately gave him some carrots and maise and this is the moment that Hermanus became part of the ZURI household. 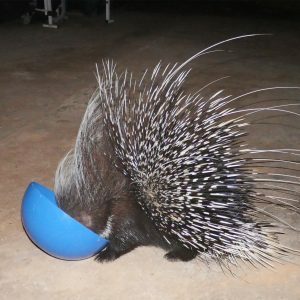 During the next couple of months Hermanus made an appearance most evenings when he came back to the house for some dog food. 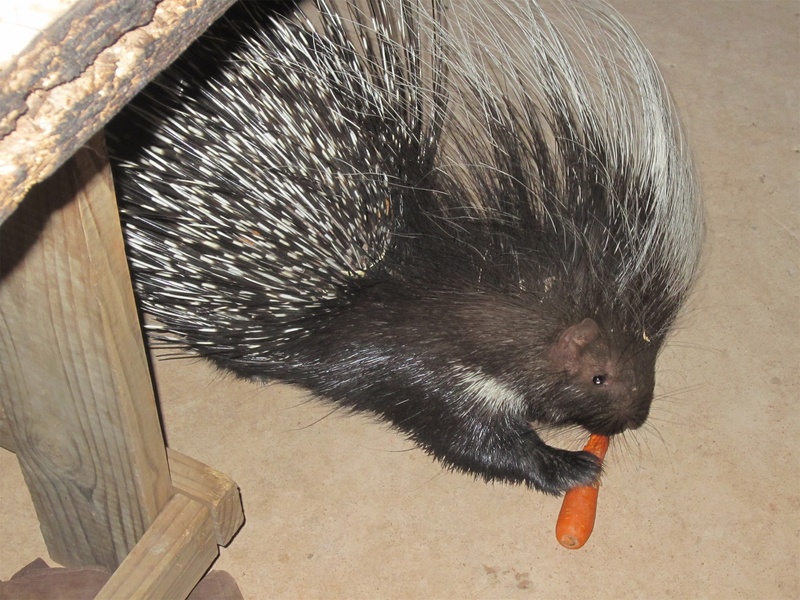 He especially loves dog food and even prefer it over carrots and maise. 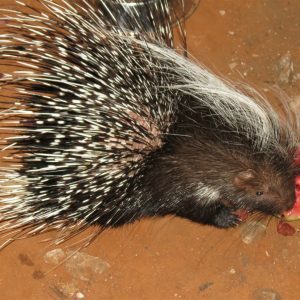 During this time he became very tame and the dogs and cats accepted him as part of the ZURI household. 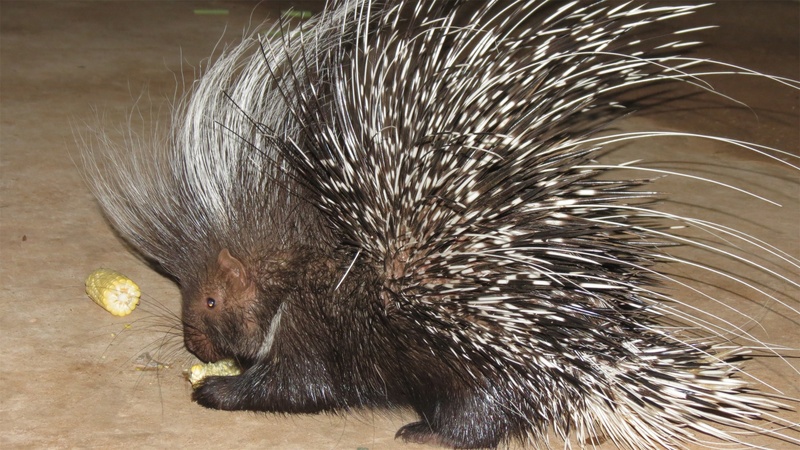 Many visitors to ZURI had the privilege to see a porcupine up close and to experience their behavior. In March 2016 we had a magic moment when Hermanus brought home his family. 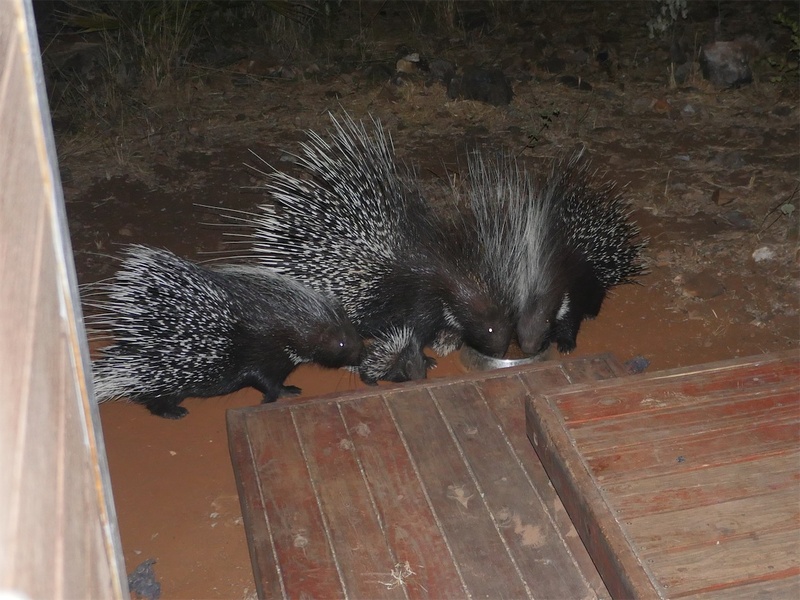 One evening there were three porcupines, two bigger ones and one young one. 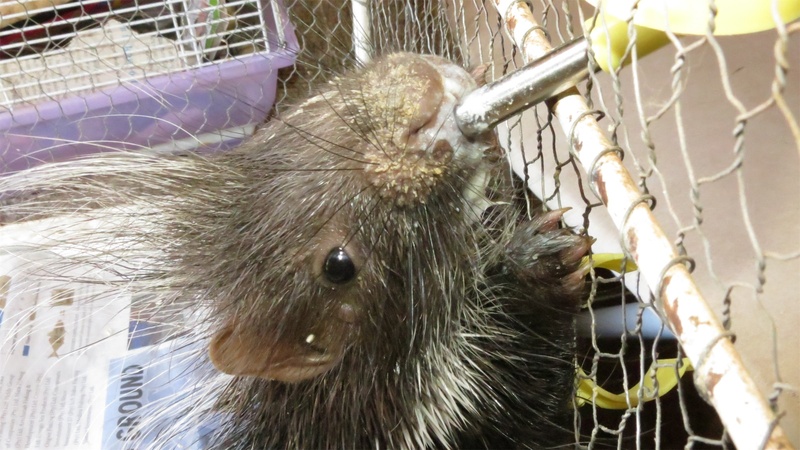 This was the very first time that we realized Hermanus was completely adapted and has gone on to breed successfully. 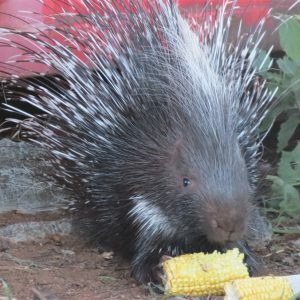 There was a bigger surprise waiting for us in July 2016 when we noticed that one of the porcupines was hiding two very small babies under her quills. In total there were six porcupines coming to visit most evenings. During the latter half of 2016 we watched the babies grow bigger. From October 2016 until April 2017 ZURI had a rainfall of a 1000 mm. This was much more than the yearly average of 500 mm. 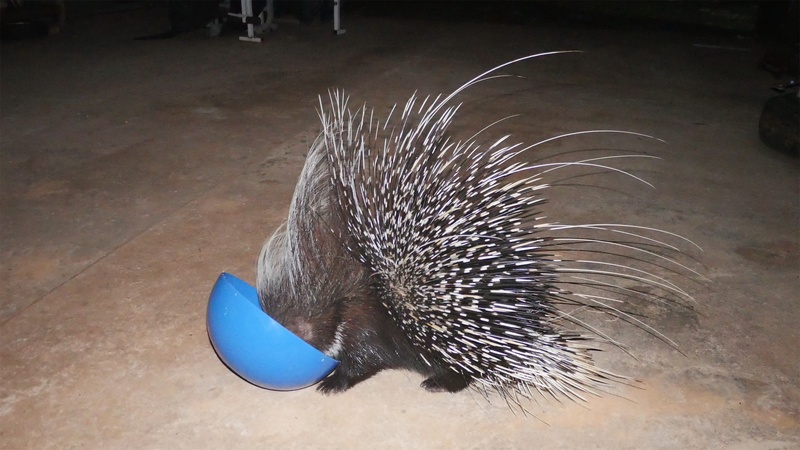 During this time we noticed that the porcupines did not come so often anymore. We think this is due to the fact that there is a lot more food in the veldt than other years. 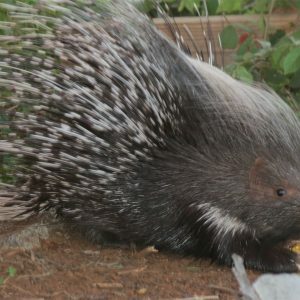 There is a smaller porcupine and a larger porcupine still coming most evenings to visit us. 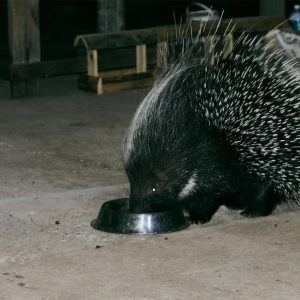 They sometimes come at 9 pm and other times during the night. 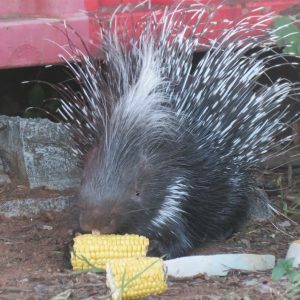 The sound of a porcupine eating one dog kibble at a time is one of the best sounds to listen to. Hermanus has made my life better. 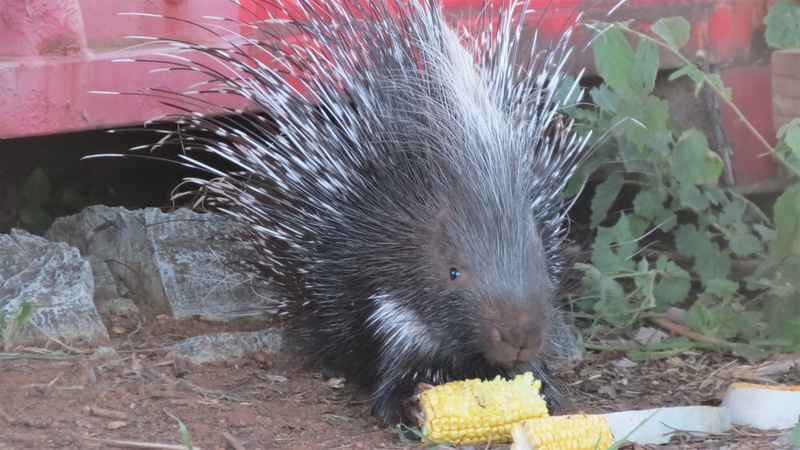 He taught me how to raise a porcupine. He taught me what beautiful animals they are. 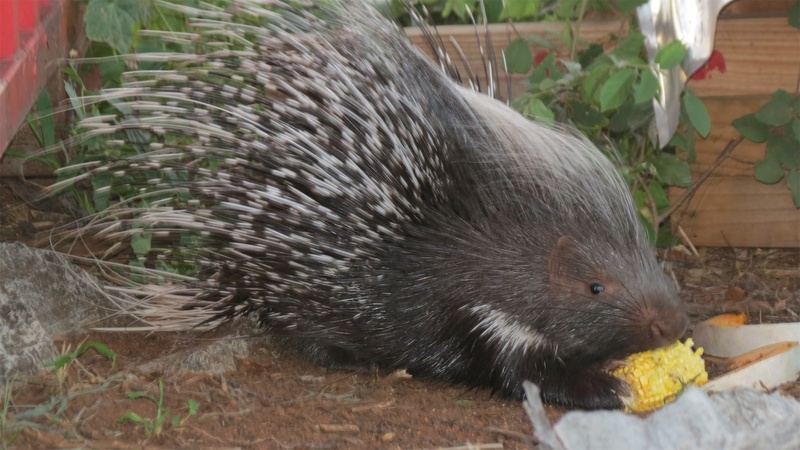 He taught me to listen every evening for the sound of his quills when he appears from no-where in the bushes. He made me smile every time I see one of my special porcupines.